This is my second "0" sized multi-scale. Today, January 7, 2008, I put the strings on for the first time. The back and sides are an unusual nearly dead black Cocobolo I usually refer to as CocoNegro, the top is Carpathian Spruce. 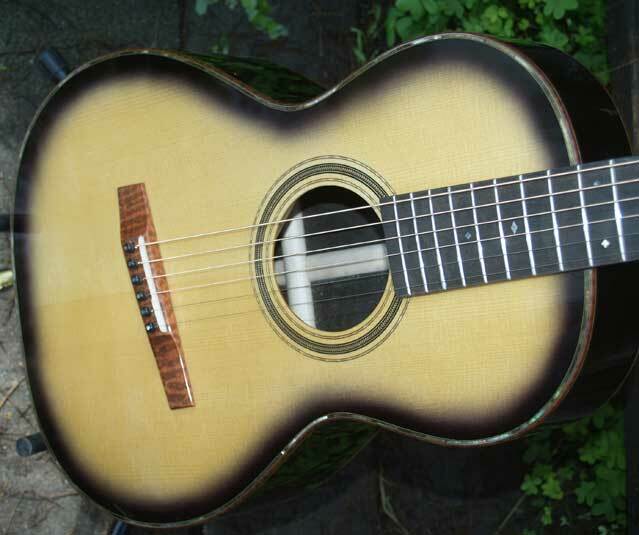 This guitar is fairly consevative except for wood choices and the multi-scale feature. The bass "E" is 25.9" long and the treble "e" is 25.2". The intention is a more powerful and focused bass than traditional "0" guitars, and a little more bite in the treble as well. I will show this guitar January 17 through 20 at booth 1615 at NAMM's winter event in Anaheim, as well as making it available to be played at the Luthier's Consortium event the evenings of the 17th, 18th, and 19th at the nearby Islander Inn. For pictures of the building process, click HERE. guitar in the room !!!!! So I say "Who needs a dreadnought when you've got Bruce on your side" Thanks for this amazing instrument. CocoNegro back and sides with a Carpathian top, Snakewood binding, headplate, and bridge featuring hand fluted wings. Top purfling is Black Pearl. Oil Varnish finish and Gold Waverly Tuners.